Egidija Čiricaitė, Chris Gibson and George Cullen all studied MA Book Arts at Camberwell. After graduating they set up ‘Collective Investigations’ and have recently been awarded an Arts Council Grant for their project codex: between this and that. Here they tell us about their experience at Camberwell and their new project. Can you tell us about what you were doing before you started on MA Book Arts? Egidija: I came to MA Book Arts from the Foundation course at Chelsea College of Art and Design. However, I have been working on various graphic design projects since my first round of higher education in late nineties, when I was studying for the MA in English Linguistics in Lithuania. Chris: Originally I did a Fine Art BA at Sheffield-Hallam in Time-based Art and after that I spent several years doing a nine-to-five job and making art on the side. George: Before the MA I studied Graphic Design and Fine Art. I also took part in various small publishers fairs in London and Cardiff producing zines and exploring bookbinding and book structure. Why did you choose this particular Masters course? Egidija: As I was graduating from the Foundation course at Chelsea, I realised I wanted to continue with my arts education, but I felt that yet another BA was not an option. I was looking for an MA course that would allow me to combine my nerdy self with my creative self: I have a background in linguistics and a history of making. In addition, the course had to be either at Chelsea or Camberwell – I could only proceed with a course which was near home because of the family commitments. Chris: My work has always featured books, either as a source material or as part of the content. I didn’t know why books were so central to my practice, so I wanted to spend some time exploring that in a rigorous and more focused way, with the hope it would invigorate my work. George: I was exploring books from a design angle for a while before the course but wanted to focus my practice. I chose the course as a way of exploring my thoughts in the book. My practice was becoming more fine art based and it provided me with a group to explore this. How did you find the course structure and the way you were taught? Egidija: I chose the part-time option of the course (now Extended Full Time). As a student with a non-arts background I had a lot of catching up to do. I have got a family too, which means, I need extra time to allow for the parents’ evenings and swimming lessons. The course gave me a lot of freedom to explore my potential. I spent much of my time at the ceramics workshops where I experimented with porcelain and fired papers. I spent time in the library and casting too. There were no theory lectures, but there was a variety of speakers from a range of disciplines on Wednesdays to support professional development. Chris: The course structure wasn’t too much of a culture shock due to my fine art background, but getting my head around the established and sometimes conflicting idea of what Book Art can be, took some time. George: The nature of the course group was that we were all from different backgrounds not necessarily from a book arts but all with an interest in the book. This was really stimulating in terms of the group crits and learning from your peers. We had various self directed and structured crit sessions in which you could talk about your work with input from other people. This was really useful for testing ideas and learning through others experiences. Can you give us an example or two of the particular projects that you undertook on the course? Egidija: Over the course of my MA I completed an investigation into memory/forgetting and the book in that context. In the summer before the course started I came across a wheelbarrow full of books in my parent’s barn. The books were on the way to be burnt. They were old Soviet propaganda books that nobody needed or wanted anymore. I brought the books (minus the wheelbarrow) to London and I used them as a starting point to explore durability of historical truth and fetish of the book. I have worked with ceramics before, so it was only natural to take my books there first. 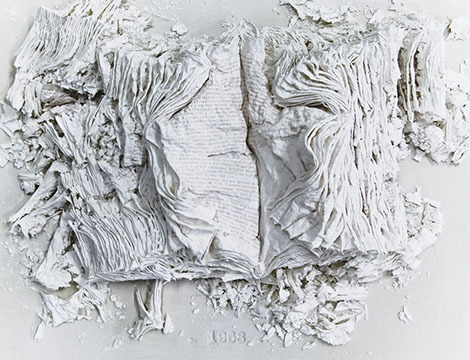 After a few months of experimentation I started producing very delicate sculptures of fired books. As a result of this project I have also produced a set of artist’s books and live cast bronze sculptures. Chris: The course was very open-ended so by the second semester I was developing projects outside the institution, either finding a local gallery to exhibit in with friends or creating work in response to specific places. By working outside the college it eased the transition when creating work post-Camberwell. George: I think the final project for the graduate show was the most interesting for me. It gave me a chance to look over my past two years and pull out the links between the work I was making. I used it to present a body of work that became the culmination of my thinking at the time. I was able to pinpoint my interests in the book and realise what brought me to book arts in the first place. What have you been doing since you graduated from the course? Egidija: At the graduation show, my books were bought by Tate Library’s Special Collection – this gave me an important boost of confidence. I have since exhibited and curated in book art and fine art contexts in the UK and abroad. I have run creative bookmaking workshops in in schools, galleries and museums, including the British Museum. Chris: Since graduating I have still been doing a day job, but my focus has been much more on making my own work and getting involved with opportunities and projects. 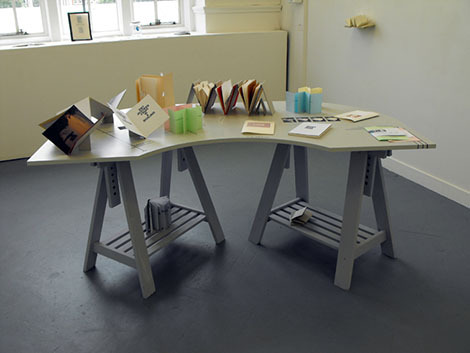 George: Since graduating I have been developing my work through exhibitions and book fairs. I’ve taken part in a group show with a group of artists from the course and also artists from different backgrounds. I’ve shown at book fairs inside and outside of London which has been a useful way for the public to engage in my work and a different set up to an exhibition. My work has also been included in the Tate Library, London. Congratulations on receiving an Arts Council grant! Could you tell us a bit about the project, Codex: Between This and That? 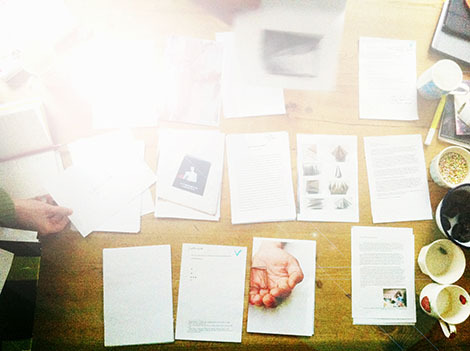 The project was born on our kitchen table as part of a larger collaborative project between the three of us called ‘Collective Investigations’. We were looking at the ways to widen discourse on the idea of the book and so codex: between this and that was born. We submitted the application for an Arts Council arts grant in January and six weeks later we had a thick envelope through the doors with the positive reply. The project as it is would have not been possible without Arts Council’s support. A publication – It is an artist’s book that explores thoughts, opinions and ideas that book as a codex represents through the many contexts of its existence. The publication contains contributions from Mark Cockram, Les Bicknell, Riccardo Boglione, Michelle Brown, Paul Coldwell, Ali van Dam, Janine Harrington, Susan Johanknecht, Sharon Kivland, Pauline Lamont-Fisher, Richard Price, Stevie Ronnie, Erin K. Schmidt, Abi Thomas. It will be launched on 26 April, 2013 at Bookartbookshop, London. 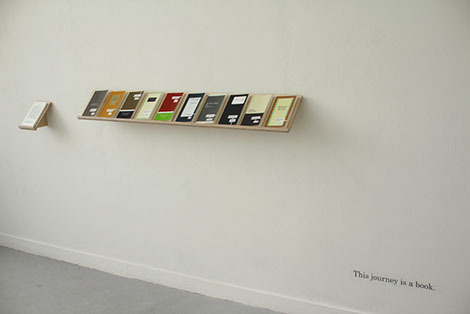 An exhibition – at Bookartbookshop (April 19 – May 03 2013) in which we have created work responding to the shop and its collection. Workshops – They are creative bookmaking workshops at Shoreditch and Clapham libraries aimed at introducing the general public to the possibilities of the book. The workshops are free. When codex: between this and that is finished we expect to continue with other types of investigation in response to other venues. Each will involve exhibitions, workshops and publications. How has your MA helped you? Egidija: The MA has allowed me to grow as a professional artist, first of all. It gave me the confidence and it has introduced me to the networks and the skills that allowed me develop after graduation. Chris: The MA has proved incredibly useful. It allowed for a period of intensive reflection and experimentation. It introduced me to a lot of artists (both students and established artists) whose work addresses very similar ideas to my own. The location of the college can’t be overstated, as there is so much happening in London. George: The MA has helped me by focusing my practice and allowing me to explore my work within a group. It has given me a great base of artistic knowledge in London. What’s the best advice you were given while at Camberwell? Chris: A visiting lecturer gave us some excellent advice and that was to develop a minimum standard of working that you can achieve every day, rain or shine so that you are always in the habit of making or reflecting. I worked part-time to fund myself, so this was useful advice as it pushed me to find time each day to keeping working or thinking about my art. George: Document your progress. This becomes a crucial tool for development. Reflecting on what I had done always led to something else. What tips would you give to a student starting out on this course at Camberwell? Chris: There are so many opportunities (from exhibitions to see, talks to attend, facilities to use) that I would recommend only focusing on the things that will help the development of your work. Find a structure for recording things that works for you (like a sketchbook, a notebook or blog etc.) and keep it well, as it’s surprising what things you might want to revisit or refer to as the course progresses. George: Use the group while it is there. You will learn the most from your peers so make sure you are an active part of it.